Three bands, three cities and vigor to exceed the boundaries of the music industry took the Catalyst Atrium stage on Friday night — all in the name of rock ‘n’ roll. 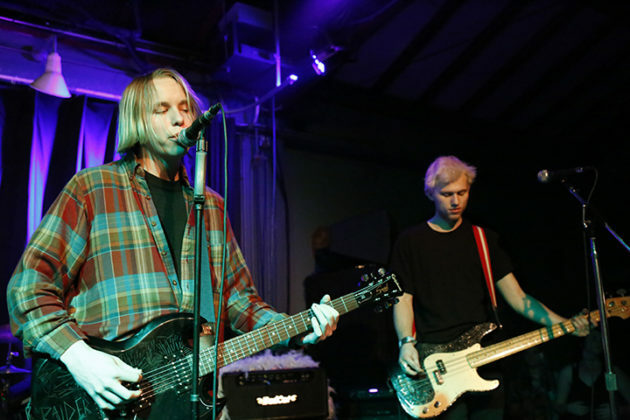 “For the funkiest part of Northern California, Santa Cruz, this song’s called ‘Drive North,’” said SWMRS singer and guitarist Cole Becker into the mic before starting to play. The line “I hate Los Angeles” was repeated throughout the chorus with a scowl on his face. 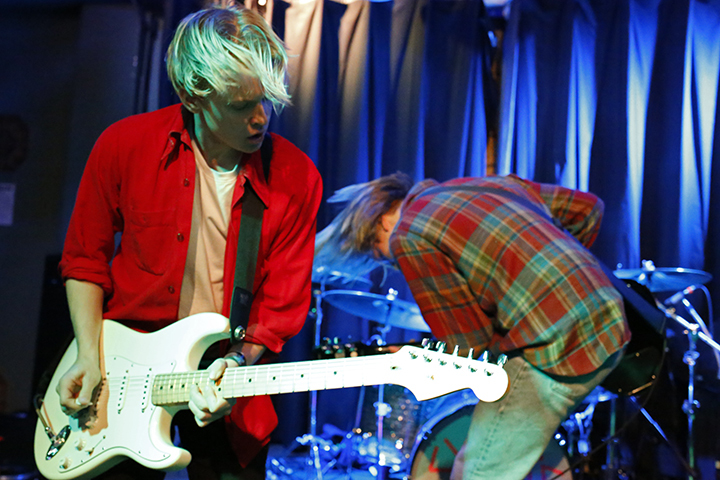 The alternative rock and surf-punk band of four from Oakland, SWMRS — pronounced “swimmers” — fueled the energy of the crowd of about 100 with tracks from their debut album “Drive North.” The LP is expected to be released on Feb. 12 via their personal label, Uncool Records, produced by FIDLAR lead singer Zac Carper. Before the formation of SWMRS, the band dabbled in different musical spheres, from Vans Warped Tour in 2013 to the festival Beach Goth in 2015, until abandoning their label Rise records and starting fresh with Uncool Records in early September. Now the band consists of brothers Cole and Max Becker on vocals and guitar, drummer Joey Armstrong and bassist Seb Mueller. Drawn to West Coast surf culture, Creative Director Hedi Slimane of Saint Laurent Paris fashion line noticed the Becker brothers at Burgerama in 2015. SWMRS was then asked to release an original song for Saint Laurent Paris’ Surf Sound Spring/Summer 2016 Collection as tribute to the California music scene — embodying a gritty surf-rock sound. “Drive North” is a tribute to the music scene in the Bay Area, shifting the attention away from Los Angeles, an industry where artists yearn for originality and “corporate control” dominates. “I think that too much stuff revolves around LA and New York City,” said SWMRS member Max Becker. Max said he noticed the presence of the tech industry beginning to outweigh the art industry of the bay. But beyond the tech boom, guitarist Jesse Nestler of the Watergate Sandals, a band of four UCSC students who kicked off the show, acknowledged the importance of being well-established as a band to succeed. The band’s fusion of psychedelic, metal, glam, punk, surf and garage rock — self-categorized as “scooter rock” — is well received in Santa Cruz. Despite these barriers, The Watergate Sandals takes pride in their successes, and recognizes the standards of the music industry. The Aquadolls followed, voicing the same message of breaking free from the confinement. They advocated rebelling against authority figures like parents and teachers, particularly for the younger fans at the show. Crowd surfers were thrown about, and concert attendees moshed, nodding along with the anarchical messages of the artists that voiced the constraints of the industry. Fans sang along as SWMRS played their hit single, “Miley” which supports Miley Cyrus’ eccentricity and free spirit, after being ridiculed by the media in her transition from Disney Channel. “You push the envelope on all sides, I can’t get enough, alright,” the Becker brothers from SWMRS sang. 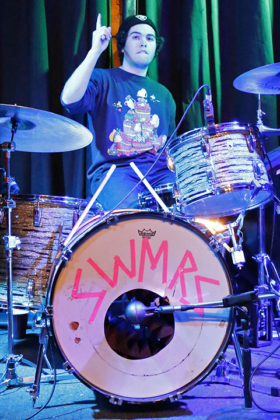 SWMRS channeled this cutting edge attitude on stage, and didn’t bite their tongue when it came to opinions about their experiences in the music industry. This idea of fearless innovation in the music industry resonated with Zane Shattuck, too. The string of bands aims to make their marks in the corporate entertainment industry and enjoy doing it. Previous articleWhat’s the Deal With Local Comedy?